Strangers photographing the ATLAS detector are a familiar sight for those working down in the pit. But last week, things were a little bit different: the detector was being photographed in preparation for its Hollywood debut in the dramatisation of Dan Brown’s best-seller Angels and Demons. Anyone at ATLAS who has read the novel is sure to have their own opinions on the author’s particular “creative” take on the laws of physics and his representation of CERN. But, like it or not, CERN plays an important part in the story – as the location from which antimatter is stolen by a secret society intent on creating a bomb to destroy the Vatican. Stammers captured images of the detector from a range of vantage points, his ultimate aim being to create a 3D view of it as it is seen from the fourth level platform. This will allow the company to later recreate any different perspective on the detector – from that level – that they wish. The implication that physicists could operate the detector in close proximity, shielded only by a sheet of glass, is bound to ruffle the feathers of anyone who knows the first thing about the health risks involved with radiation and magnetic fields, and the stringent safety measures employed by ATLAS. But aside from this blatant bending of the truth in the pursuit of a dramatic scene, director Ron Howard is apparently keen to make the physics in the film more plausible than it was in the original book. 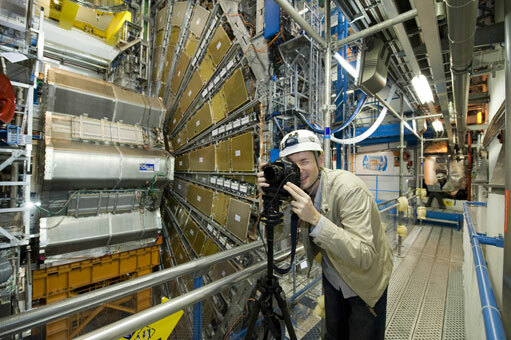 He visited CERN in July 2007, and spoke with CERN antimatter expert, Rolf Landua, as he took a tour of Point 1.